This paper reviews existing concepts, methods and tools for assessing children’s psychosocial wellbeing and evaluating subsequent interventions. It highlights examples of best practice and makes recommendations regarding some basic principles and minimum standards for working with children. 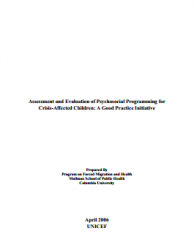 It is designed to promote sharing of lessons learned and a cross-fertilization of assessment and evaluation strategies. This paper should be considered a “working document” insofar as we hope that its dissemination among colleagues in the field and at headquarters will provide critical review and further input from a variety of disciplines, cultural settings and regional perspectives.